In my experience, competition amongst team members can be beneficial. And by competition I mean having someone on the verge of a breakthrough train with slightly faster individuals. Having someone to chase (on the track, in the pool, or on the bike) can be motivating. Shifting people into swim lanes with slightly quicker teammates can help push them that little extra bit and help get a little more effort out of an individual. And we all know that inter-team competition happens naturally during training. Whether the athletes know it or not, doing extra threshold or VO2 efforts so as not be the last one back to the parking lot isn’t always a bad thing. I’ve been known to, while running track sessions, yell to the first runner who goes past me, “Don’t let him/her catch you!” I’ll then immediately tell the athlete chasing, “Don’t let him/her get away!” This good natured competition can help push people beyond what they thought was possible. And, training with people who are faster is key to avoiding complacency in your efforts on the track, in the pool or on the bike. Most of the group training that I coach involves youth or collegiate athletes. Therefore, I definitely have to take the physical development and maturity of the athlete into consideration. With athletes under 12 years of age I don’t try to encourage as much competition unless it is in a game type setting, for example 100-meter relays. My goal for those athletes is to make training fun and get them coming back for more. When athletes reach a more competitive level, then there will be situations where competition is encouraged. It is something that I use to simulate competition and isn’t used very frequently. In most daily training sessions an athlete should be focused on their specific paces, even if the workout is similar to that of their peers around them. When working with groups of athletes I actively look for ways to encourage competition amongst the group throughout the training process. Certainly, there are individual workouts where discipline to one’s own training zones is key, but those are mostly performed in a solo-setting. In a group environment, I like to use the “positive charge” of the group to help each athlete elevate their game and thus enhance training adaptation. By creating team-focused or group exercises each athlete can use their fellow training partners to push harder, dig deeper and achieve their very best. The key to all of these exercises is creating a positive and encouraging environment that drives athletes to push themselves, while at the same time not allowing the competition to begin pushing others down. The goal is always to raise the game of everyone in the group, always positive and always forward! 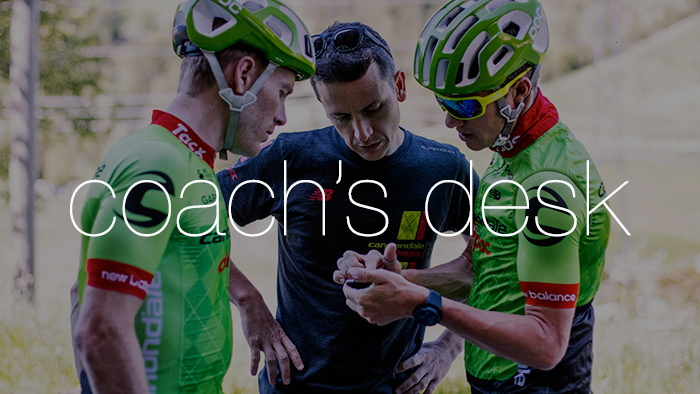 Properly coaching in a team setting or group setting can be extremely rewarding for both the athlete and the coach. It can also have many negative effects, where undertraining and overtraining can easily occur, or even a potential injury. For our triathletes/athletes in our group we have a wide array of ages, goals, equipment being used, fitness and skill levels participating in our team workouts. For example, we have athletes showing up with their fully equipped Felt IA spaceships, and others who ride on an old mountain bike—but both athletes come ready to work hard. I would say that I rarely “discourage” athletes from competing against each other. If I feel an athlete wants to push at a level he/she is not physically ready to do (in the sense that they might get injured, especially during a run), I end up creating scenarios where I tell them how much time I want them to “race” or produce “higher efforts.” This way the “competition” phase of the workout is controlled to a period of time, with plenty of recovery before, during and after those phases. With beginner athletes who show up for group workouts, I have a tendency to either swim, ride or run with them, so I can go over how to properly warm up, and when to “compete” and how to “compete” during the team workouts. Since I deal with adults during our team workouts, I encourage them to really focus on competing against themselves first, so they can self-improve, and during the portions of the workout where higher intensities are needed, to push each other so a higher effort can be achieved. Lastly, I try to create a workout setting where everyone who shows up gets the full benefit of the workout. This means properly setting up the swim, bike ride or run, with a warm up, a couple of main sets, and a cool down. This naturally sets up a “controlled discourage period of competition” and encourages each athlete to focus on their own pacing and goals.